You were supposed to chew one now, save the other one for later. If I had a nickel for every 2-pack . . . I liked the packs of the little teeny ones. Adams Chiclets were very popular, and so were Beechnut Beechies. 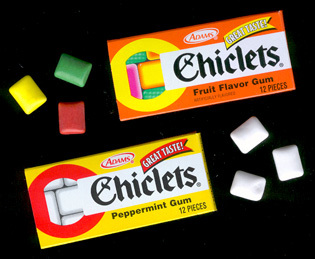 Chiclets bulged a bit, and Beechies were flatter and more rectangular. Right! The kind of penny candy you'd find in your Halloween bag. BTW, at the moment, this appears to be, by far, the most popular item in the BBeM galleries. Explain that.